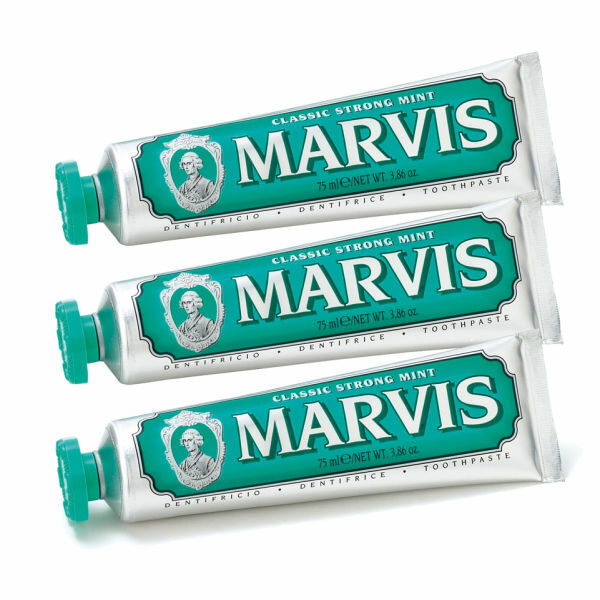 The Marvis Classic Strong Mint Toothpaste comes in a triple pack and has a strong flavour of peppermint. The tingling sensation that is left behind when you use this strong mint toothpaste is perfect for ensuring that the "just cleaned" feeling lasts for hours. The Marvis classic mint toothpaste has fluoride included to stop tooth decay, and it can also tackle problem issues such as plaque and tartar. The breath-freshening properties of the Marvis toothpaste are just a bonus! This toothpaste comes in a vintage-style tube that is far more elegant than most commercial brands, and will look great in your bathroom. This product is really helpful with my teeth. It is useful and I like the scent. You delivered the wrong item and the Marvis order went to another customer. "Good one"
I do not know how to describe the fantastic feeling to use it! Amazing toothpaste and I'm sure you will love it! this product is so excellent. it is a good experience of using. Best toothpaste I've ever used without a doubt. Very strong taste and lasts.